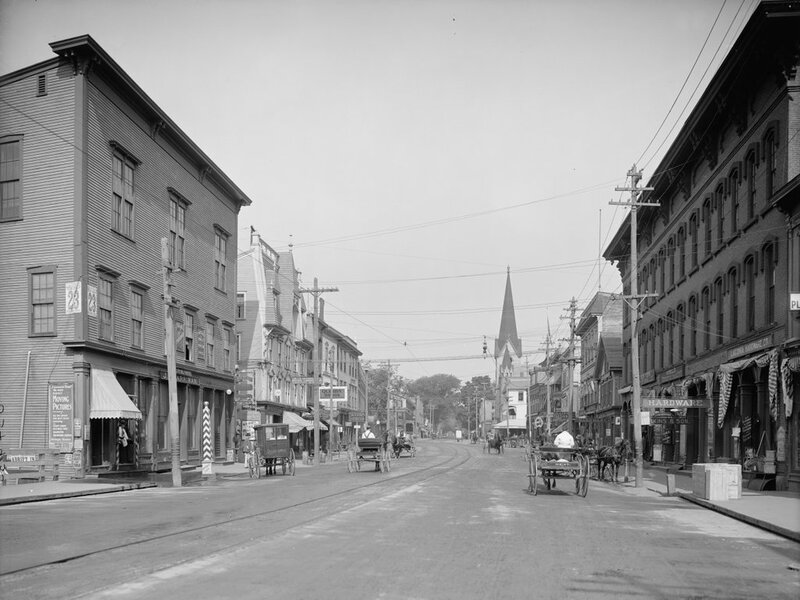 Looking north on Main Street in Laconia at the intersection of Pleasant Street, probably in 1907. Image courtesy of the Library of Congress, Detroit Publishing Company Collection. As far as I can tell, only one building from the first scene survives today: the brick building on the left side of Main Street, just to the right of the center in both photos. 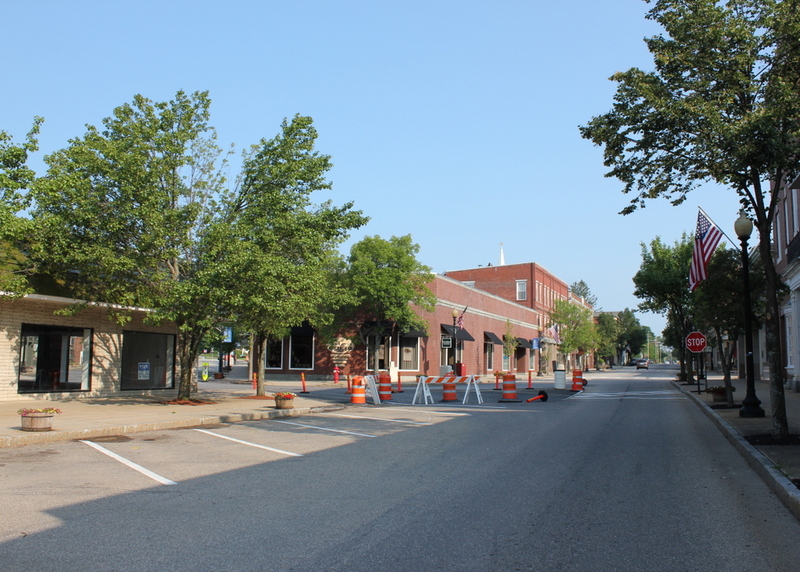 As was the case in many other parts of the country during the 1960s, a number of Laconia’s historic downtown buildings were destroyed as part of an urban renewal project. However, the most prominent building in the first scene, the Eagle Hotel, was gone before then. 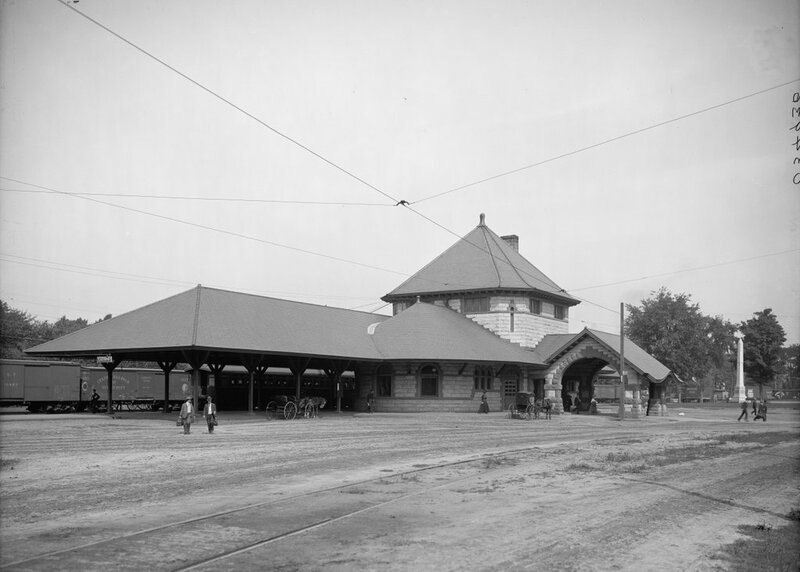 It enjoyed a prominent location right at the intersection of Main and Pleasant Streets, and was just a block away from the railroad station. 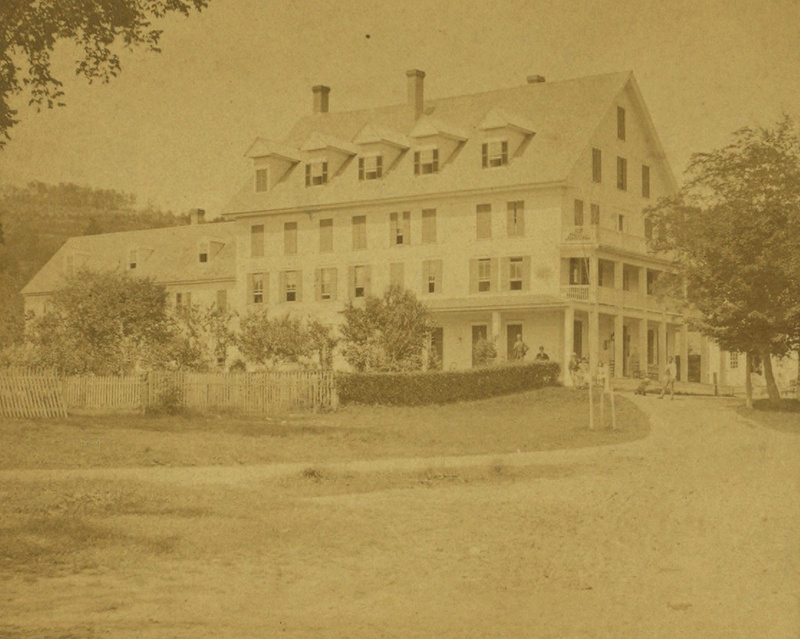 Around the time that the first photo was taken, it was one of Laconia’s most popular hotels (and, at $2.50 a day, one of its most expensive as well). 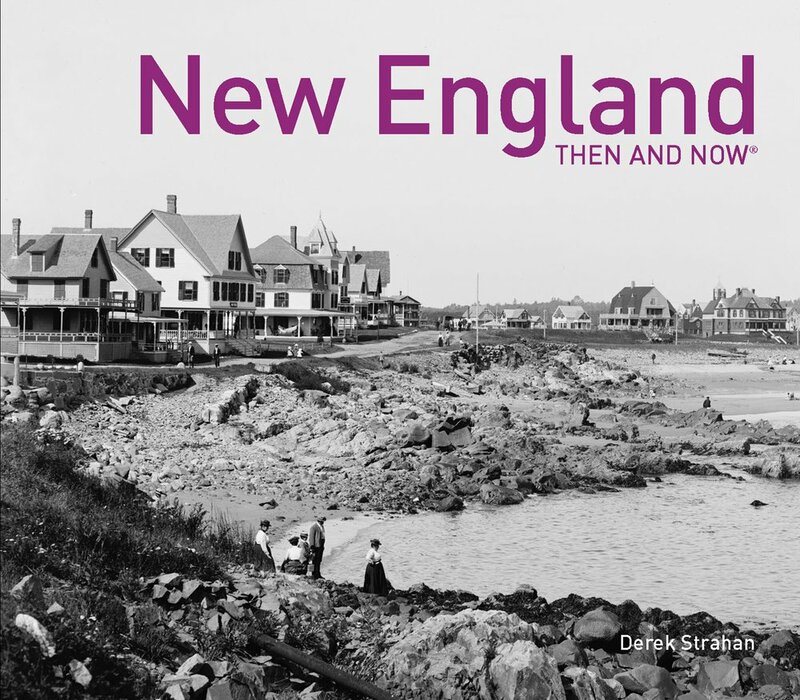 By the 1950s, the former hotel had been demolished and replaced by Woolworth’s, as seen in some of the pre-urban renewal photos featured on this Weirs Beach website. Today, the site is occupied by a one story brick building with commercial storefronts. This might be the same building that Woolworth’s was once in, but if so it has been heavily modified over the years. 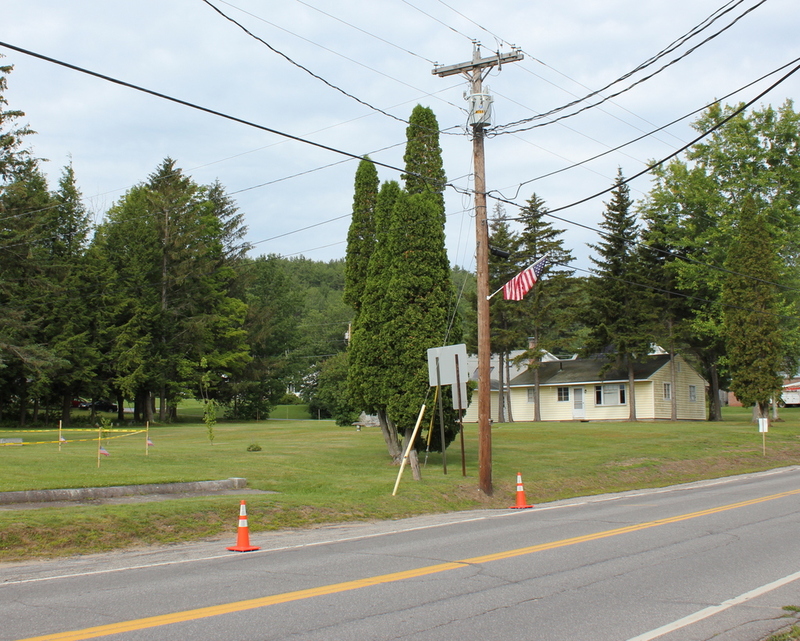 Part of the urban renewal projects involved changing some of the traffic patterns in downtown Laconia. Today, Main Street south of here (behind the photographer) is a narrow, single lane one way street that carries northbound traffic. 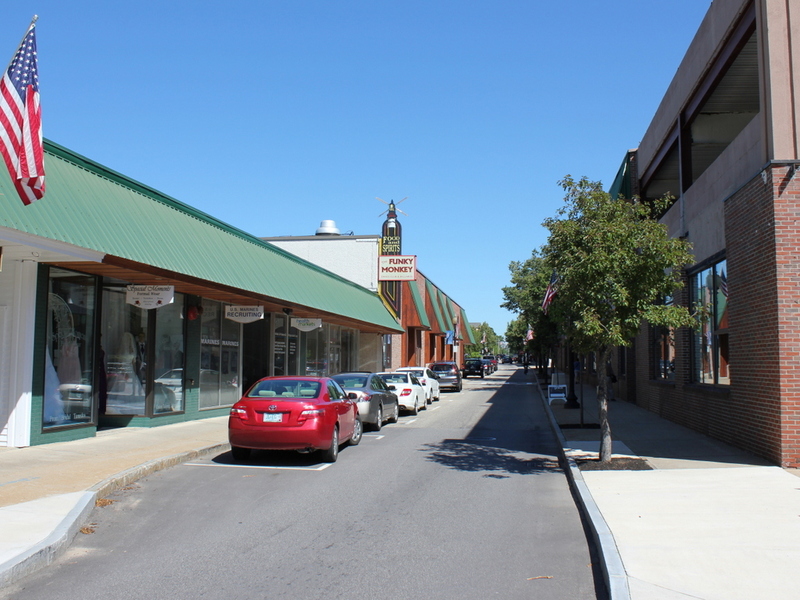 The buildings on the left-hand side of the street in that section extend about 40 feet closer to the center of the road than the pre-renewal buildings did. In this scene, the road is as wide as it was a century ago, but it still has just one way northbound traffic, with angled on-street parking taking up what was once the southbound travel lane. Pleasant Street is now one way, southbound, and any traffic on the street must circle around the former Woolworth’s site and head back north on Main Street. Although the first scene is mostly deserted, there are a few interesting things going on. The man on the far left appears to be a street sweeper; he is pushing what looks like a large, wheeled canvas bag while holding a broom and probably a pick. He is looking at the ground, and it seems like he is about to walk into the path of the oncoming trolley. The trolley has a handbill on the front, advertising for “Adrift in New York,” which would be showing at the Moulton Opera House on Tuesday, September 17. The Library of Congress estimates that the this photo was taken in 1908, but September 17 fell on a Tuesday in 1907, so the photo was probably taken in early to mid September of that year. Plays weren’t the only form of entertainment that was available at the Moulton Opera House, though; a sign on the sidewalk reads “Don’t Fail to See the Great Moving Pictures Tonight.” The “moving pictures” would have been early silent films, most of which were not preserved and have long since been lost to history. 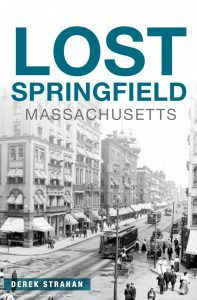 Likewise, the trolleys have been lost to history; the Laconia Street Railway shut down in 1925 amid growing competition from cars and buses. 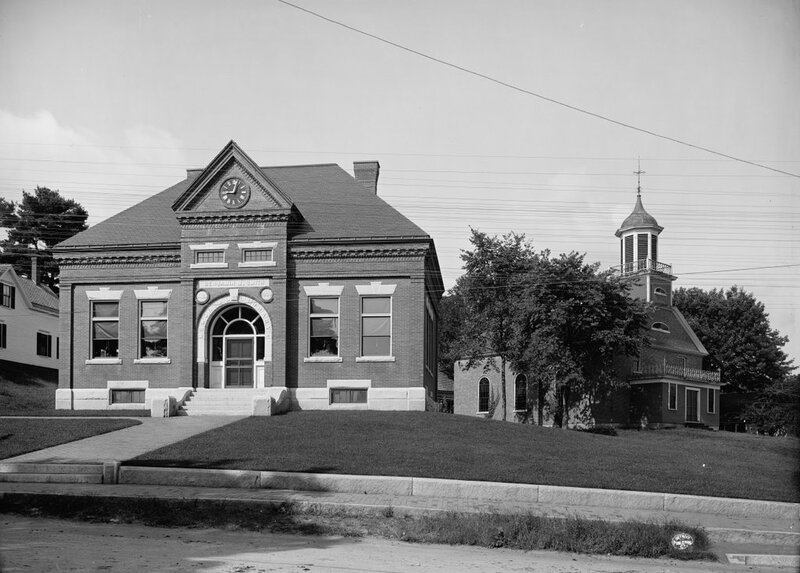 The Benjamin M. Smith Memorial Library and the Baptist Church, at the corner of Main Street and High Street in Meredith, around 1900-1910. Image courtesy of the Library of Congress, Detroit Publishing Company Collection. Meredith’s public library is one of two buildings in the town that is listed on the National Register of Historic Places. 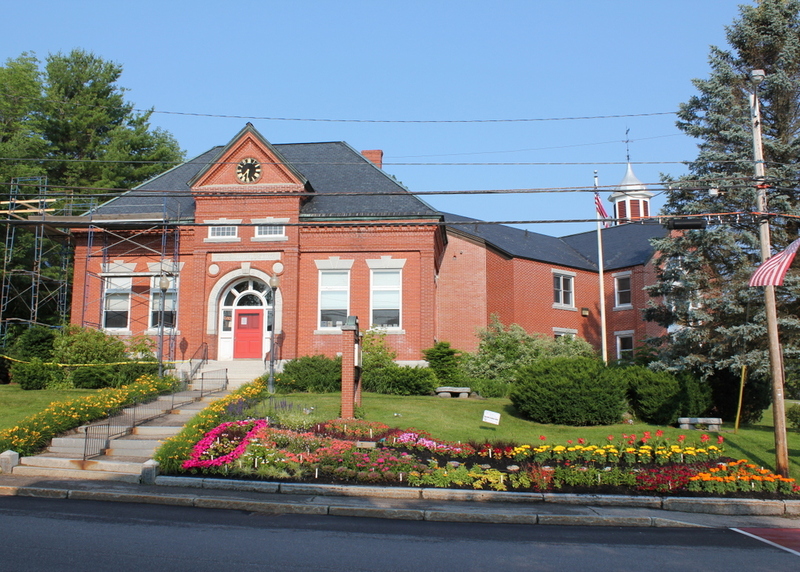 It opened in 1901, and like many other public libraries of the era it was donated by a wealthy philanthropist, Benjamin M. Smith of Beverly, Massachusetts. He had once lived in Meredith, and had the library built in memory of his parents, John and Mary Smith. Over the past century, the Main Street facade has been virtually unchanged, although in 1988 a large addition was put on to the building to the right. This addition block the view of the Baptist Church from this angle, except for the top of the spire. The church is actually much older than the library; it was built in 1834, and today it continues to be used by the First Baptist Church of Meredith. 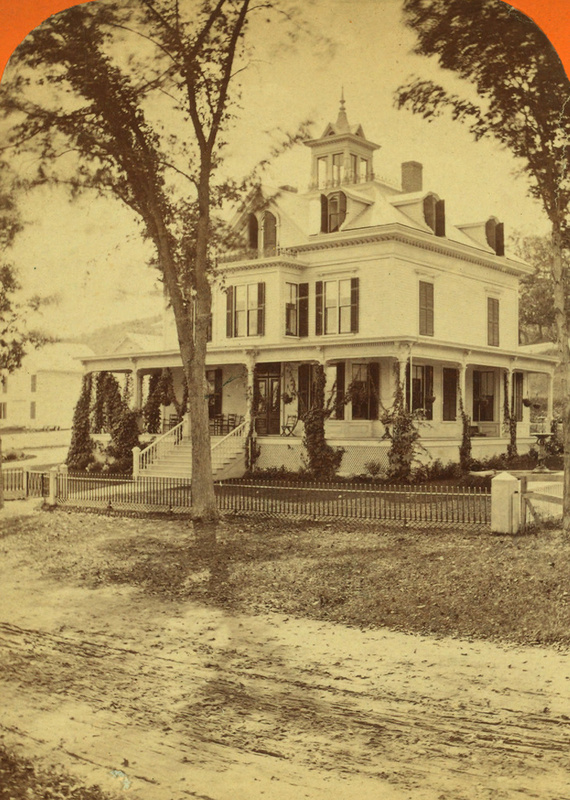 The Moulton House on present-day Dane Road in Center Harbor, around 1872. Image courtesy of the New York Public Library. I couldn’t find much about the Moulton House aside from some basic information in late 19th century guidebooks of the area. It was built sometime prior to the Civil War, and was expanded in 1868. As mentioned in this post, it was located directly behind the old Senter House, and according to an 1876 guide book could house 75 guests at $3 per day, or $12 to $20 per week. The hotel clearly played second fiddle to the larger Senter House, which was later renamed the Colonial Hotel. 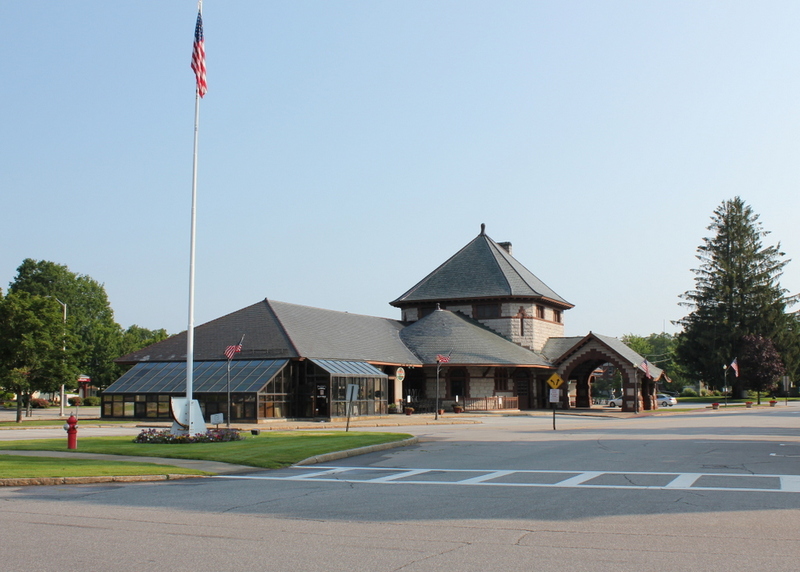 Although the rates were a dollar more per day in 1876, it offered far more amenities for guests, including beautiful views of Lake Winnipesaukee and the surrounding landscape. Much of the Moulton House’s view of the lake was blocked by, of course, the Senter House. Although literally overshadowed by the Senter House, the Moulton House was often mentioned in guidebooks as a good option for long-term visits. 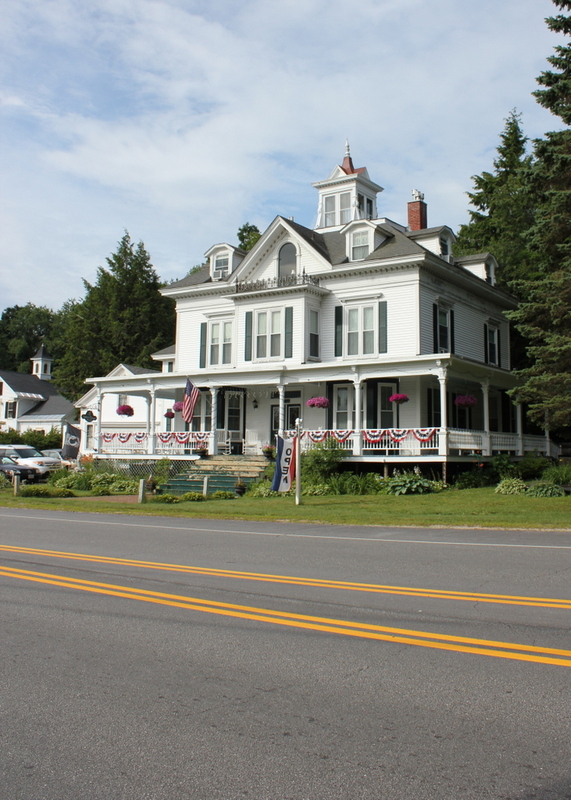 An 1868 guide mentions that it “is of smaller dimensions, yet is a pleasant house for those who wish to board and spend some time in the vicinity.” Given Center Harbor’s 19th century transportation connections,”the vicinity” meant more than just the tiny village; from here, guests could board a steamboat for Wolfeboro, Alton Bay, or Weirs Beach, or a stagecoach to Moultonborough, South Tamworth, or West Ossipee. I don’t know what happened to the Moulton House, although it is entirely possible that, like so many of its contemporaries, it burned down. 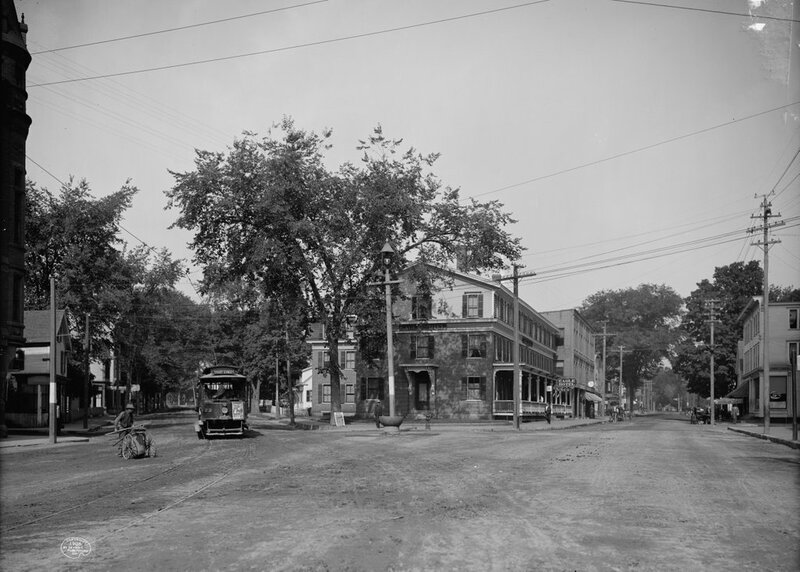 It appears in the Automobile Blue Book as late as 1910, with an advertisement, directly underneath that of the Colonial Hotel, which describes it as “In the foothills of the White Mountains and at the head of beautiful Lake Winnipesaukee. First-class house with modern conveniences. Table supplied with the best the market affords. Excellent service. Large airy rooms. Sanitary plumbing. Baths. Electric lights. Season, May to October, inclusive.” The Colonial Hotel burned down 9 years later, and at some point the Moulton House was also lost to history. The home of Eliza Sutton in Center Harbor, around 1865-1885. Image courtesy of the New York Public Library. This house on the present-day Whittier Highway was built in 1865 for Eben Sutton, a wool merchant in Peabody Mass., and his wife Eliza. Eben died before the house was finished, but Eliza lived here for 24 years. She ran a dairy farm here, using the fields across the street as pastureland. The photo in this post, taken about 17 years after her death, shows the view from in front of her house looking across the street. In addition to her agricultural pursuits, she was also a philanthropist, and in 1869 she donated funds to build the Eben Dale Sutton Reference Library at the Peabody Institute Library in her hometown. The first photo was taken during the time when Eliza Sutton lived there, and the photographer was Charles Bierstadt, a 19th century photographer who specialized in stereoscopic views. He is probably best known, though, as the older brother of landscape artist Albert Bierstadt. Most of the younger Bierstadt’s paintings were of the American west, but he did several of the White Mountains, not too far from where his brother Charles took this photograph. The house was damaged by a fire in 1993, but it has since been restored to its original 19th century appearance and operates as the Sutton House bed and breakfast.